A weak baby whale was rescued from low tide by a group of Costa Rican surfers who couldn't stand by idly as the baby cried out for help. Costa Rican newspaper Amelia Rueda (AR) says Mauricio Camareno was coming in from catching some waves at Boca Barranca beach when he saw a strange, large lump. When he got closer, he realized it was a baby pilot whale — crying out for help. The whale had swum up the river and got caught at low tide on the riverbank. The animal was exhausted by its efforts to break free. "She was very weak and could not keep afloat," Camareno reported to AR, as translated by the Costa Rican Star. So the surfers decided to take matters into their own hands. First the men had to use all their strength to drag her back out to deeper waters. 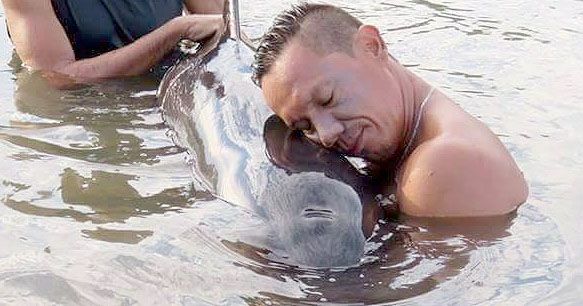 For the next six hours, the men held the baby pilot whale at the surface so she could breathe, and they tried to encourage her to swim off into deeper waters and back into the ocean. Camareno told AR that other people at the scene called the Ministry of Environment and Energy, as well as the Coast Guard, for help, but no one ever showed up. Instead, it was the help of six selfless surfers who saved the baby pilot's life. Eventually, high tide came in, and the whale was able to swim off. How or why the baby whale ended up in the river remains a mystery. Camareno told AR it's common to see dolphins and crocodiles in the area, but not whales. The Daily Mail says baby pilot whales are born at about 4.7 feet (1.4 m) and weighing 135 pounds (61 kg), so by the looks of the photos and video footage, this pilot was pretty young. As adults, females grow up to be about 16 feet (about 4.9 m) in length, while males reach upward of 25 feet (7.6 m). Hopefully, this baby pilot is able to reach its full potential, thanks to the help of the surfers.